New legislation aims to phase out mile-long fishing nets off the California coast that have entangled and killed sea life, including endangered species, by the thousands over the past few decades. The gear, known as drift gillnets, are mainly used to catch swordfish but often net far more than what fisherman are actually targeting, according to an analysis by the NBC Bay Area Investigative Unit. While tougher restrictions and new regulations are credited for reducing the number of marine mammals unintentionally caught in the nets, state and federal lawmakers insist the impact to the environment is still detrimental. “They’re wound up tight in this net and it's strangling them,” said one man who spent nearly 30 days at sea on three different drift gillnet fishing trips in December 2016, September 2017 and December 2017. He spoke to the Investigative Unit about what he observed on the condition he remain anonymous. He shot over 100 hours of video while on board two different boats off the California coast. He told the Investigative Unit he managed to get permission from crews to be on board. However, what they didn’t realize is that the he is an undercover cameraman working for animal rights groups. A sea lion entangled in a drift gill net off the California coast. His undercover videos, as well as underwater clips showing marine life entangled in the nets, were recently released by a coalition of animal advocacy groups in an effort to get the nets banned. Those groups include Mercy for Animals, Sharkwater, Sea Legacy and the Turtle Island Restoration Network. Allen’s plan would offer to buy back permits from fisherman. Those who chose to not participate, however, would be subject to more expensive permit fees each year. The current price of $330 would increase to $3,000 by April 1, 2020. Bipartisan federal legislation has also been introduced to ban drift gillnets by 2020. Senators Dianne Feinstein, D-California; Shelley Moore Capito, R-West Virginia; and Kamala Harris, D-California, authored the Driftnet Modernization and Bycatch Reduction Act, which tasks NOAA to develop a program to help fisherman transition to more environmentally friendly alternatives. Drift gill nets can stretch a mile long, roughly the span of the entire Golden Gate Bridge. The fishing gear is typically about a 100 feet tall. Drift gillnets can stretch up to a mile long, or roughly the entire span of the Golden Gate Bridge. The gear is typically 100 feet tall and must remain attached to a boat, and can only be dropped into the ocean from about sunset to sunrise. The National Oceanic and Atmospheric Administration regulates the use of drift gillnets. “Clearly this fishery has long been subject to a great deal of scrutiny,” said Michael Milstein, a NOAA spokesperson who provided a statement to the Investigative Unit. “We understand this fishery and its impacts well,” said Milstein, who points to decades of data collected by NOAA. Since 1990, the agency has randomly placed government employees aboard fishing vessels to document how often marine mammals, sea turtles, seabirds and fish are caught and killed in drift gillnets. The Investigative Unit obtained and analyzed those records — nearly three decades worth — and discovered fisherman only kept about 23 percent of what their drift gillnets caught over the past 28 years. The rest was tossed back into the ocean — either alive, injured, or dead. The Investigative Unit first began reporting on the impact of drift gillnets two years ago. Observers board about 20 percent of all fishing trips that use the nets. So in order to determine the rate for entire fleet of boats using the nets, the federal government calculates estimated totals each year. Using those figures, the Investigative Unit calculated totals for specific species and found drift gillnets have killed 87,929 sharks, 4,135 dolphins and 1,218 sea lions over the past 28 years. The nets also killed an estimated 456 whales and 136 sea turtles, which include endangered and threatened species. “We have worked with fishermen over the last few decades, and we have also added controls and restrictions to reduce unintended impacts on protected species such as dolphins and whales,” Milstein said. Holes in the netting are now larger and must be at least 14 inches wide. Additionally, noise making devices have to be attached all along the net to scare away unintended victims such as dolphins and whales. Since the federal government started requiring those acoustic pingers in 1997, the number of entangled marine mammals has been cut in half, according to a government report. NOAA is also considering installing cameras on fishing boats to keep a closer watch on what is caught. “The result is that the fishery is now much safer, although it is also much smaller in terms of the number of vessels than it used to be,” Milstein said. Nearly 30 years ago, 141 fisherman used drift gillnets. Today, only about 20 fisherman regularly rely on the gear. Fisherman Gary Burke has used drift gillnets off the California coast since the practice began in the 1970s. Environmental groups are pushing for fisherman to a use an alternative type of gear known as deep set buoy gear, which uses buoys to drop fishing lines 1,000 feet below the surface in order to better target swordfish and avoid marine mammals that prefer warmer waters closer the surface. In contrast, drift gillnets are set just 36 feet below water. “Everybody is going to lose their livelihoods,” said Gary Burke, a fisherman opposed to the phase-out legislation. 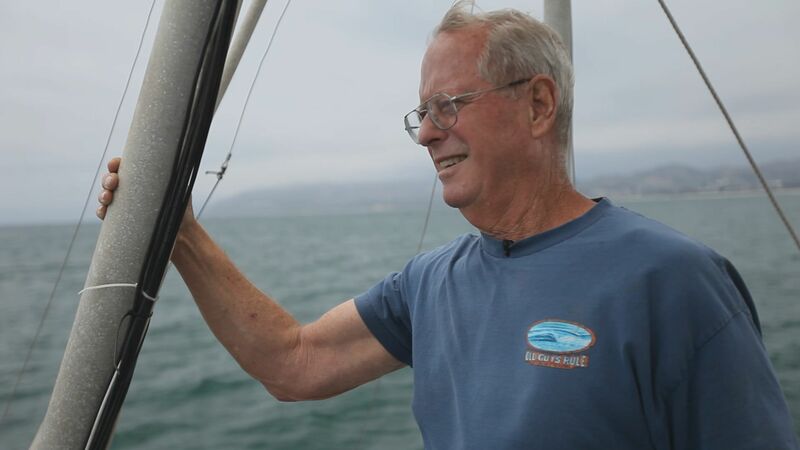 He has used drift gillnets off the California coast since the practice began in the 1970s. “They’re pigeonholing [fisherman] in a corner with this bill – ‘take what little money we're offering you or we'll put you out of business through regulations and restrictions and economically force you to do things that will cost you so much you can't afford to go fishing,’” Burke said. Burke says tougher standards and new regulations regarding drift gillnets have already lessened the impact on marine mammals. Over the past five years, the nets haven’t snagged a single sea turtle, according to government records. The nets, however, did entangle and kill 15 whales during that same time period. While the gear is also used to net certain types of sharks, half the sharks pulled aboard last weren’t the right catch so they were tossed back into the ocean, most of them already dead. The drift gillnet fishery along the West Coast only accounts for less than one percent of the swordfish consumed across the country. About 76 percent of the nation’s swordfish is imported from other countries, according to NOAA, many of which use drift gillnets and have even fewer regulations than the United States. Burke believes banning the gear in the U.S. will undoubtedly lead to more imports of swordfish that have been caught using questionable practices abroad.